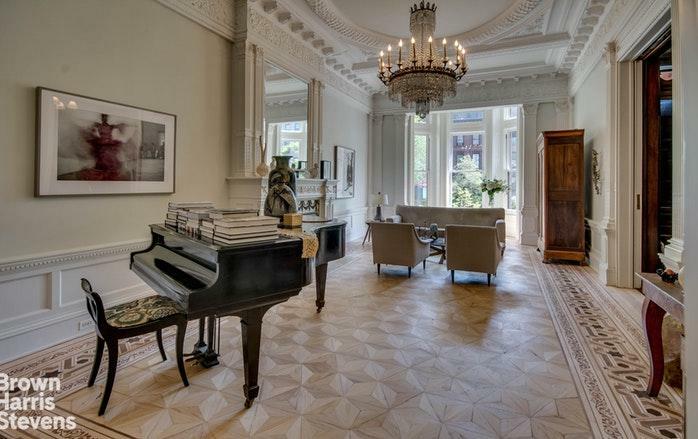 A truly extraordinary 25' wide brownstone on a 200' deep property, this elegant historic mansion was built in 1887. It is an architectural gem located in historic Clinton Hill, where early industrialists built their mansions along quiet tree-lined streets. This neighborhood is one of the borough's most culturally and architecturally interesting and is home to many noted writers, artists and musicians. This home was impeccably restored in 2007 by the present owners with close attention given to the preservation of historic details. 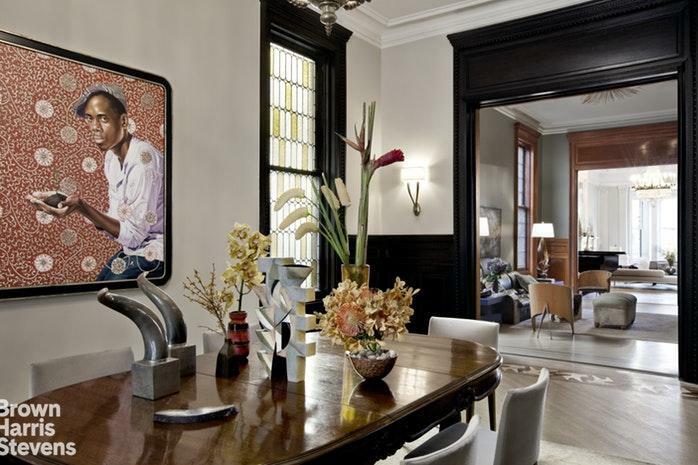 This five story building has seven bedrooms, five full baths, three half baths, eight WB fireplaces, front and rear gardens, parking and a vintage Otis elevator. The property, facing Washington Avenue, extends through to Waverly Avenue. No detail has been spared throughout this home, from the wooden floors with inlaid borders, the custom and pedigreed vintage lighting, the exquisite iron doors to the wine cellar, the intricate plaster work on the front parlor ceiling, the stained glass windows and transoms, the eat-in kitchen topped by a 30' standing seam copper dome and a dramatic curved steel and wood staircase in a sky-lit alcove. The quadruple parlor, with windows on the north, east and west sides of the property, consists of a formal and an informal living room, a formal dining room and a spectacular eat-in kitchen with a wall of custom curved glass windows overlooking the landscaped garden. 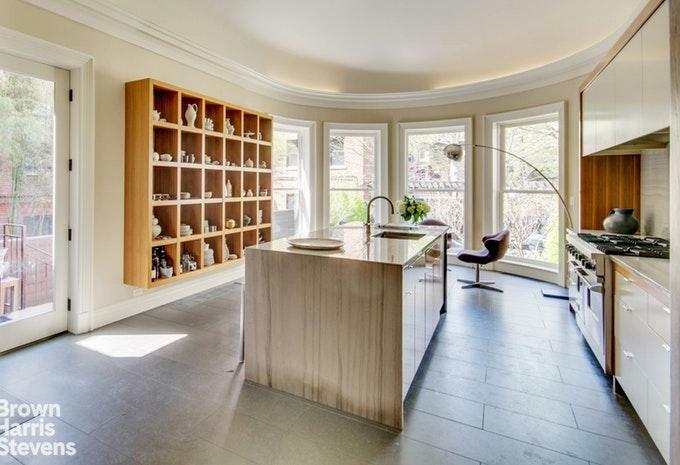 The kitchen has radiant heat, custom cabinetry and beautiful light. 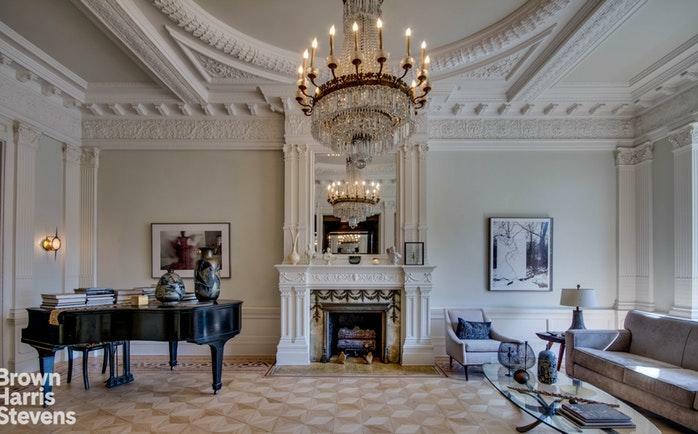 Creating a feeling of both elegance and comfort, there are two WBFP of carved wood, stained glass windows, high ceilings, and beautifully restored plaster moldings and woodwork. The second level has the master bedroom, master bath, and an elegant bathing room with a fireplace, stained glass windows, and a the tub centered in the middle of the room; truly indulging one's creature comforts. There is a library at the back that can be used as an additional bedroom. The third level has two master suites with baths and dressing rooms, as well as a spacious sky-lit laundry room and supply closet. The top floor has a skylight, two bedrooms, a full bath and an office. All of the electrical and plumbing was updated and central air was installed throughout the house. The facade was redone as well as the roof. The gardens have been landscaped in both the front and rear of the building. There is parking accessed from the rear of the property. This is truly a rare find. This home has a wow factor that never fades. It has charm, beauty and an abundance of light.